Cameco Shares Still Standing After Getting Hit By Double-Dose of Bad News | Energy and Gold Ltd.
Hopefully 2017 can only get better for Cameco (CCJ) after a brutal double-dose of bad news to begin the year. First, on January 17th Cameco slashed its guidance and told investors that it expects to report a net loss for 2016. Then this morning Japanese utility Tepco told Cameco that it does not plan to honor what is likely Cameco’s most lucrative long-term uranium supply contract (~US$108/lb) for nearly 10 million pounds of U3O8 over the next decade. CCJ rose ~80% from last November to its peak ($13.36) a few weeks ago and even after the double-dose of bad news CCJ shares remain above their rising 50-day simple moving average and important support/resistance near $10.80. In addition, CCJ put in a higher low this morning relative to the January 17th low, and the much lighter volume than what we saw on the 17th might be an indication that investors have digested all the bad news and are no longer as motivated to dump CCJ shares. 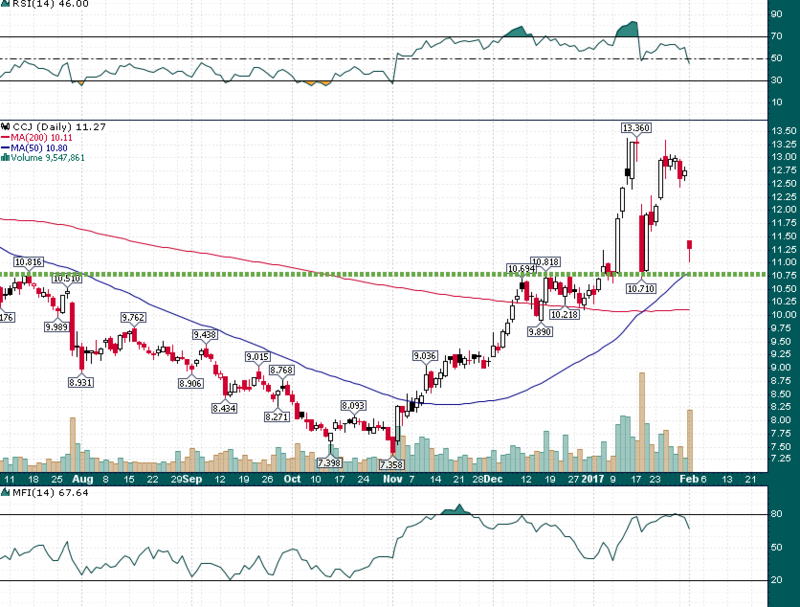 While I don’t have any special insights into Cameco or the Tepco contract situation, I do know that when a stock holds up well in the face of bad news it is often a bullish sign. CCJ shares are still standing after a 1-2 punch and it might be time for CCJ to ‘punch back’ with some good news of its own. There was an interesting comment on the $CCO channel on CEO.ca earlier which offered an explanation as to how the Tepco news could turn out to be bullish for uranium prices over the near term.